According to a CDC study from 2003, domestic violence is the cause of two million injuries in the U.S. every year. Beginning this year, the state of Illinois has a new law educating hair stylists, nail technicians, and aestheticians on ways to help customers who are victims of domestic violence. Joan Rowan is a hair stylist and owner of two hair salons in the Chicagoland area. In her forty-one-year career, she has had multiple conversations with clients who were experiencing domestic abuse: “Sometimes they tell you so much they never come back again, because they’re afraid, or they’re embarrassed, they don’t know what to do.” Rowan has provided training to her stylists to help them support their clients, but she has wished there were more she could do. For a long time, public health campaigns among others have recognized the value of hair salons and barber shops as centers for community education and organizing, so the concept of making use of these venues is not new. But the state of Illinois is now building on these relationships with a new law that went into effect January 1st. Advocated for by the nonprofit Chicago Says No More, the law is the first of its kind to reach out and provide a one-hour training to hair stylists and nail technicians every two years as part of their license renewal. Over the next two years, it’s estimated about 88,000 stylists will participate in the program. Chicago Says No More created the “Listen. Support. Connect.” program with the help of Cosmetologists Chicago. The program educates stylists on how to identify signs of abuse and assault and provide resources. 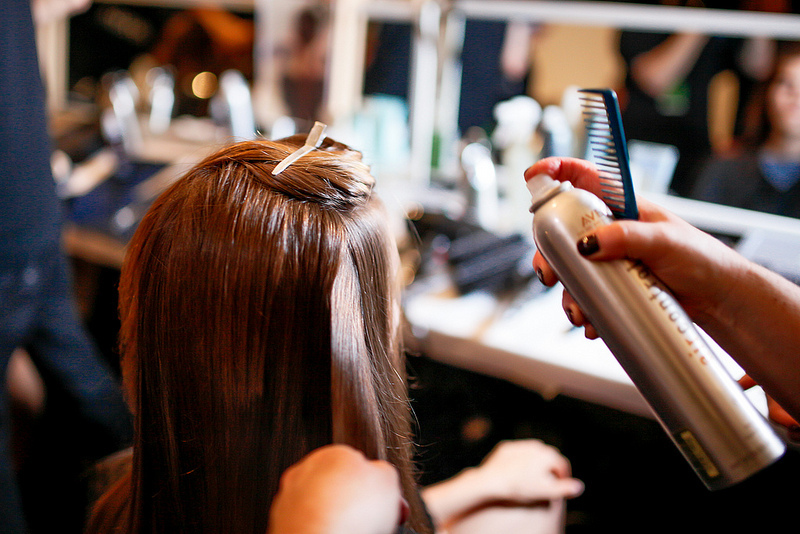 Stylists are required to participate in the program but do not have to report the violence and are protected from any liability. Although the number of independent neighborhood hair salons has been decreasing over the last forty years, hair stylists and their salons continue to have a special relationship with their clients and community. Often, they serve clients for many years and sometimes multiple generations of the same family. The relationship is something Illinois State Senator Bill Cunningham, one of the legislators responsible for introducing the law, knows personally: His wife was a hairstylist in her early twenties. The program was built upon the Professional Beauty Association’s Cut It Out Campaign. The national campaign provides resources “mobilizing salon professionals and others to fight the epidemic of domestic abuse in communities across the U.S.” It was created in 2003 after a similar statewide program was developed by the Women’s Fund of Greater Birmingham and the Alabama Coalition Against Domestic Violence. Gayle Nelson, Esq is a leader responsible for raising millions of dollars for diverse nonprofit organizations. Since over three quarters of revenue flows from individuals, Gayle begins her work expanding organizational capacity by coaching leadership on development best practices and engaging new volunteers. In addition, she reaches out to major and younger donors planning exciting events and increasing visibility utilizing crowdfunding, social media tools, and traditional media outlets. With a strong network and knowledge of philanthropy, Gayle coaches organizations of various sizes on opportunities to increase revenue from Donor Advised Funds (DAF) and planned giving vehicles as well as public and private foundations. Additionally, she often writes proposals funding new programs and develops earned income revenue streams. As an attorney, Gayle is also an advocate, partnering with nonprofits to enhance their relationships with government leaders to pinpoint community need and promote agency services. And, to ensure activities lead to thriving organizations and long-term sustainable growth, Gayle utilizes her financial acumen to partner with Boards and finance staff to build comprehensive program and agency budgets. Finally, she is a highly respected speaker on diverse topics including shifting government funding, succession planning, and inter-generational board/volunteer engagement. This story is excruciating not only because of the story that it tells, but in the underlying and—it would appear, unconscious—narrative that it contains. Mergers can have monetary benefits, but having a shared vision is far more important.